Latest AutoCAD 2020 support! 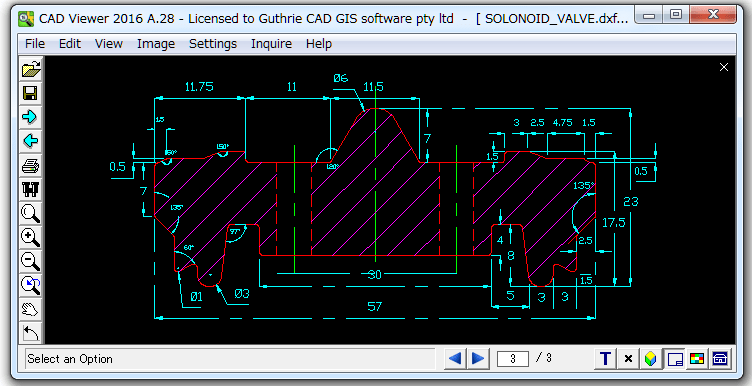 This software is a very easy-to-use, fast and reliable non online AutoCAD® DXF / DWF file viewer. You can open and view hundreds of .DWF / .DXF files simultaneously. We also offer an advanced version of our DXF file/DWF file Viewer, CAD Markup 2019, that includes markup and measurement features. Click here to view the details of the CAD Markup 2019. View and print all AutoCAD DXF and DWG versions 2.5 to 2019 (DWF versions 4.2, 5.5, 6.0). You can save all DXF / DWF files to PDF. Browser style Forward/Back buttons allow multiple (up to 1000) drawings to be loaded simultaneously. You can find other amazing features of our DWF / DXF Viewer from here. CAD Viewer is a quick and accurate DWF and DXF viewer. Watch this short video clip to find out how fast and easy you can view DWF and DXF on CAD Viewer! STEP 1. Open file folder. STEP 2. Select to view a DXF file or DWF file. STEP 3. Press Open button. Then the selected DXF or DWF file will be displayed on CAD viewer. DWF Viewer / DXF Viewer now! The evaluation version of CAD Viewer is enabled for 21 days. Buy a standard license. Prices starts from US$89. You can see details of the price structure from here. Buy a network license. Prices starts from US$360. You can see details of the price structure from here. Open a Drawing file by locating the file using the usual Windows Browse dialog. Files can be opened on your local hard drive, floppy diskette, CD, or local network. You can load multiple files in one go by highlighting all the files you want to view and then clicking 'Open'. Click on the first file, press the 'Shift' key and click the end file of the range. Hold down the 'Control' (Ctrl) key while clicking on the file. Click the below button to view details of our DXF/ DWF Viewer. CAD Viewer 2019 supports DXF external reference entities, known as Xrefs. An Xref is a drawing external to the current drawing which is referred to or is inserted into the current drawing. An Xref will always be a reference to an external .DWG file. It may have a fully specified path, for example 'D:\TITLEBLOCKS\A1.DWG', or there may be no path, for example 'A1.DWG'. - the list of Search Paths as specified in the CAD Viewer DXFXREFS.INI file. If not found in any of the above locations the software asks if you want to ignore the Xref or locate it using File Browse. If you locate the Xref using Browse then you will further be asked if you want to add the folder in which the Xref was located, to the software's Xrefs Search Paths list. The Xrefs Search Paths list is stored in the DXFXREFS.INI file in the [SearchPaths] Section. Xrefs are typically Title Blocks or drawing objects whose specification is fairly static. For this reason the software gives the option to cache these drawings for faster access. After a time there may be a build up of the cached Xrefs. If you want to clean out the Xrefs folder click the 'Clear Xrefs Cache' in the Preferences dialog.